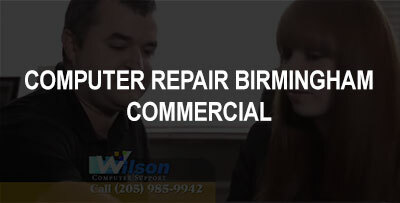 Wilson Computer Support | Birmingham Alabama Computer Repair, Website Design, and Hosting. We're moving! Effective March 11th we will be in our new office. Our objective is to provide our business clients with quick resolutions to their technical problems. We understand that if your technical difficulties slow down your business, then that affects your revenue. With our focus on customer service and knowledgeable staff, we can help you with your next technical problem. Update and Maintenance, Social Media Setup and Maintenance, etc. No matter what business you are in, technology has become more and more a part of your daily work life. Wilson Computer Support was established to make that technology work for you to accomplish more, not less, as time goes by. From explaining how to get the most out of your current investment to helping you implement new technologies -- we are your professional support system. With tools that allow us to be available to you at the touch of a button, we take all the frustration out of working with technology. We can help you and your staff experience the difference that comes from working with true professionals -- and at competitive rates. No matter whether you are on Windows®, Macintosh®, Linux® or Unix®, our knowledgeable support staff knows them all. Our goal is to move your service call from the Urgent to the Solved column of our service report as quickly as possible. We look forward to assisting with any problem or question you have, as well as helping your business grow through the effective use of technology. We offer the best service and knowledge to our business clients in the Birmingham area. We work in a timely and efficient manner to get your business computer issues fixed quickly in order to get your business back up and running smoothly. And we make sure that our technicians communicate about technical issues in a way that you can understand. That is just one of the many positive differences you'll notice in Wilson's service personnel compared with that of our competitors. Give us a call today, or the next time you have a computer-related problem, to talk with one of our friendly staff. Our Web division has worked on projects ranging from small business starter sites to large, corporate sites with e-commerce functionality. We pride ourselves on having a thorough understanding of Web technology and the ability to create interesting, exciting and purposeful websites and applications suited to your specific needs. We work closely with our customers to make their websites uniquely their own so they don't appear to be created by a cookie-cutter designer who simply changes colors and company names. We walk with you through every step in the process of your website's design and development. Our copywriters are professionals with years of website writing experience and keyword expertise, and our photographers are equally qualified. Our web hosting packages provide the control, flexibility and reliability that your business needs to maintain a successful online presence. At Wilson Computer Support, we think it is important to have an overall strategy to maintain the highest level of uptime and the least amount of hassles. With this in mind, we have partnered with some of the best companies in their fields and offer services to help you lower the costs for your business and get the services that you deserve. 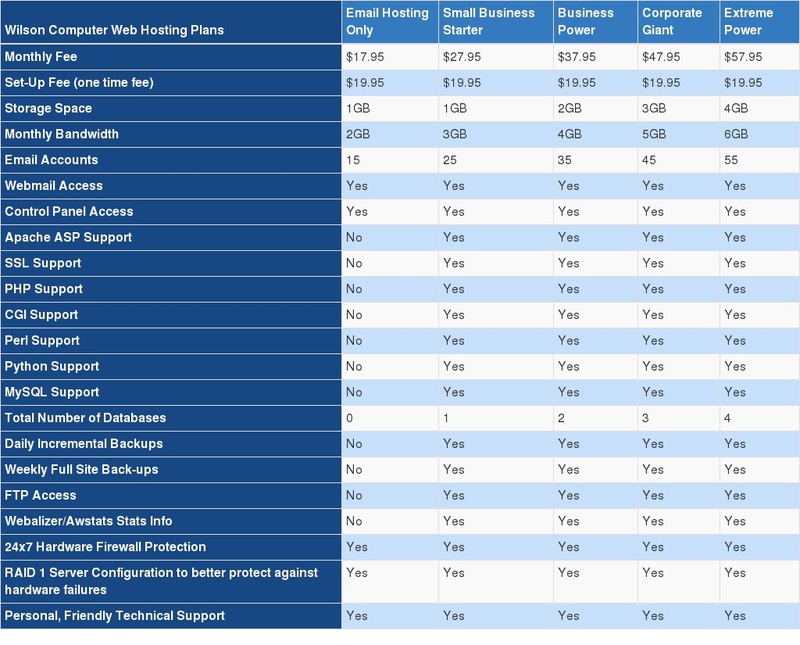 It all starts with your web hosting and email solution for your company. We have partnered with Rackspace, an industry leader in hosting solutions, to offer you the best website hosting packages that include nightly backups and firewall protection. We also offer a hosted exchange option through Rackspace that gives you the advanced email features that you need without the added cost. We have built-in spam assassin to our Linux hosted accounts but for those customers that don't want to take the time to train, we offer a monthly spam filtering service for your entire domain through JunkEmailFilter. We have not had a single customer have a spam problem after adding our spam filtering service. It is also important to make sure you are getting a nightly backup of your business critical files. To help with this, we offer online backups that we monitor through Mozy, another industry leader. We have many more solutions. Please contact our office and speak with one of our sales representatives to find out what is best for your business and what we can help you with today. Wilson Computer Support is a full-service, professional computer support and services company serving the needs of individuals and businesses alike. We recently expanded our capabilities and staff through acquisition of two computer companies and changed our name to better reflect our commitment to providing the best in computer repair, service and applications. 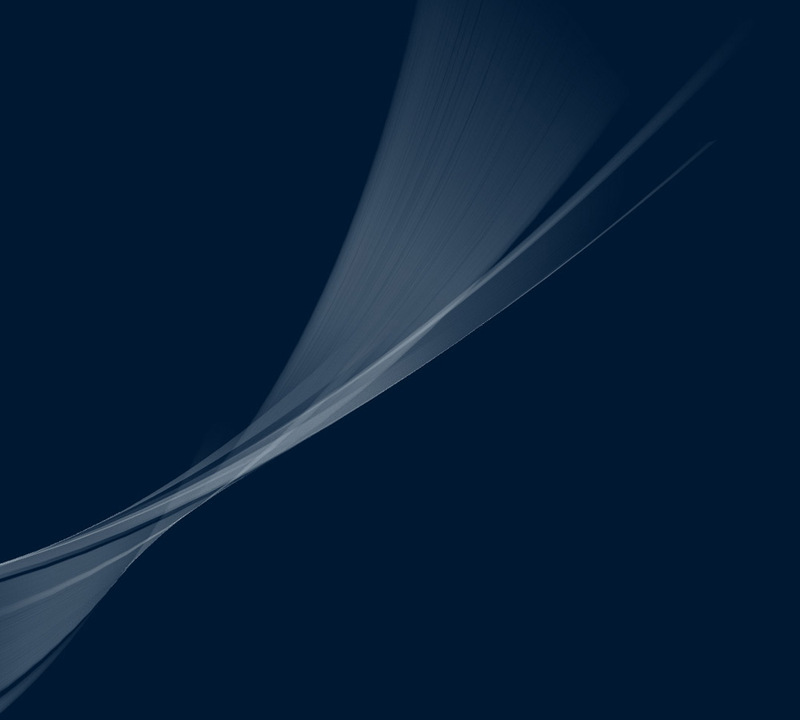 We love working with technology products and helping customers with any problem from cleaning viruses and spyware off their computers to linking remote offices together to helping them realize the benefit of open source software to facilitating their successful Web presence. Ed Kovalchick - Net Profit Inc.
glitch. How many people / companies can you say that for? Thank you Allan and associates. In this engaging video presentation, Nemertes Research Senior Vice President and Founding Partner Andreas Antonopoulos will provide a tactical walkthrough of the SIEM enablement process and answer key questions on how to successfully put SIEM into action. Published by: SenSage Inc.